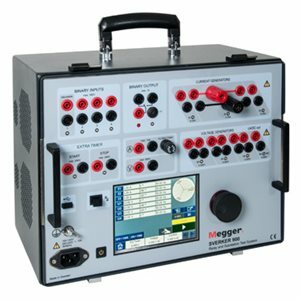 The SVERKER 900 Relay and Substation Test System is the engineer’s ultimate toolbox that addresses the increasing need for three-phase testing capability in electrical distribution substations, renewable power generation stations and industrial applications. The intuitive user interface is presented on the LCD touch screen. It has a powerful combination of current and voltage sources and a versatility of measurement possibilities. The SVERKER 900 is specifically designed for basic, manual threephase secondary testing of protection devices. In addition, various primary testing can be performed, since the current and voltage sources can be series- and/or parallel connected to allow for up to 105 A AC or 900 V AC output. All three current and four voltage sources can be individually adjusted with respect to amplitude, phase angle and frequency. The fourth voltage source allows for testing of numerical relays that needs a reference voltage simulating the busbar.